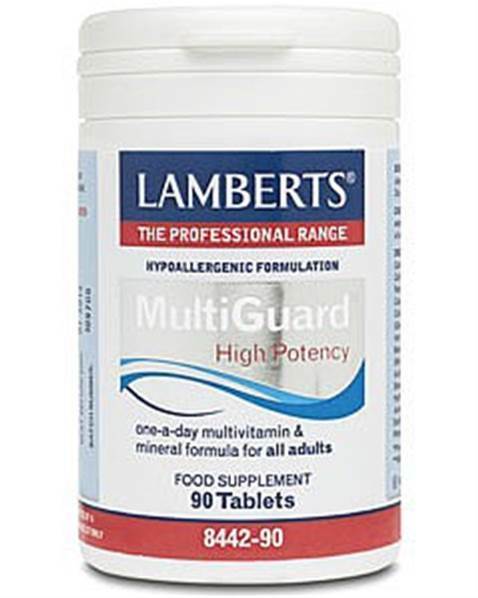 Lamberts Multi-Guard. A high potency one-a-day formula multivitamin. The mainstay of a health supplement regime and suitable for all adults. If you are looking for a high potency multi formula then we highly recommend Multi-Guard® as the best for both potency and spread of nutrients. 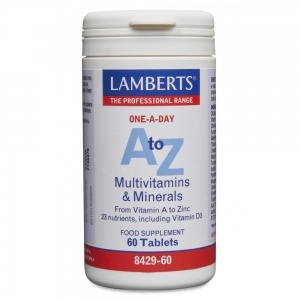 It is probably the most comprehensive one-a-day multi-vitamin and mineral formula available to practitioners, and is suitable for all adults. All the vitamins in this product are present at relevant potencies, making it a useful product where a medium to high potency B complex is needed along with excellent levels of the antioxidants vitamins C and E, and double the vitamin D content of most multis. 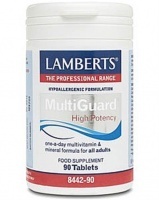 It is the trace minerals in MultiGuard® however, that have made this product so popular with practitioners. Few, if any, multi-vitamin and mineral products have such a broad spectrum of trace minerals present at relevant levels even though research shows these vital nutrients are as important, and essential, as vitamins. Of particular note is the level of selenium and chromium that have been included, that greatly exceeds the levels found in most one-a-day formulas. MultiGuard® now also contains our unique blend of plant antioxidants from green tea, rosemary and oregano extracts which provides 625 ORAC super-antioxidant units per tablet. DiCalcium Phosphate Cellulose Tablet Coating (Hydroxypropyl Methylcellulose Cellulose Colours: Titanium Dioxide & Iron Oxide) Crosslinked Cellulose Gum Silicon Dioxide Stearic Acid Magnesium Stearate Acacia.